Thames Valley Bird Forum news and updates - Woody, my rescued, injured pigeon, now big and strong! Woody, my rescued, injured pigeon, now big and strong! 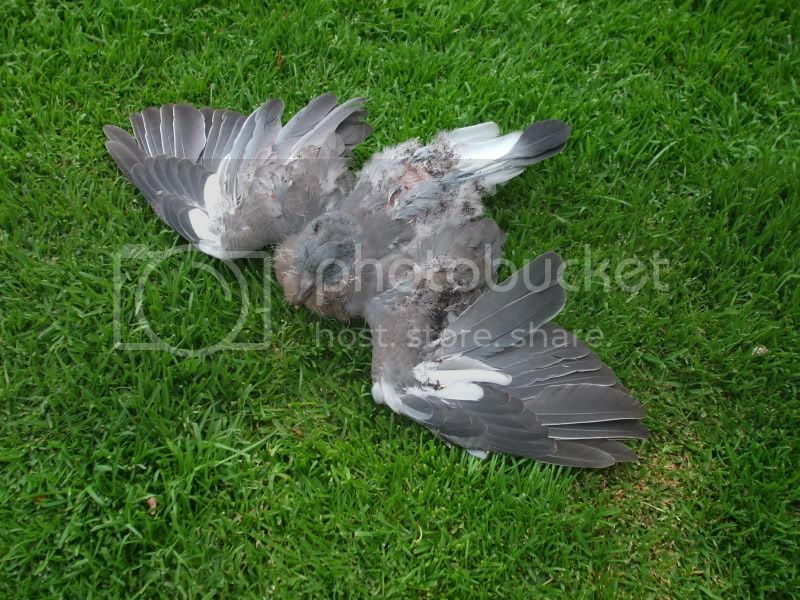 Around June 25th I noticed a slightly injured baby pigeon (grabbed by next door's cat until my dogs chased it away) wandering around our garden for a couple of days and he was roosting at night on a branch just off the ground under a bush and I was constantly looking outside and never once did I see an adult feeding it so I picked it up and put it into a box lined with paper and old soft cloth. I called it Woodie and put in seed and water in the box and I read a bit about how to care for baby pigeons and fed it porridge, mushed up warm peas, sweetcorn etc and before too long it was feeding itself and loves seed, millet, peas and sweetcorn that I defrost and warm up. I remembered we still had a cockatiel cage from when we had cockatiels a long time ago that we gave to friends with an aviary when we moved house, so I dusted it off and it has become home for Woodie with a perch and plenty of room to stretch/flap his wings. Woodie loves being stroked on his tummy and is so gentle and although I feel very attached to him, three times I have let him go (as I realise he's a wild bird) and each time he has come back within a few hours and sat on the fence or on the lawn. 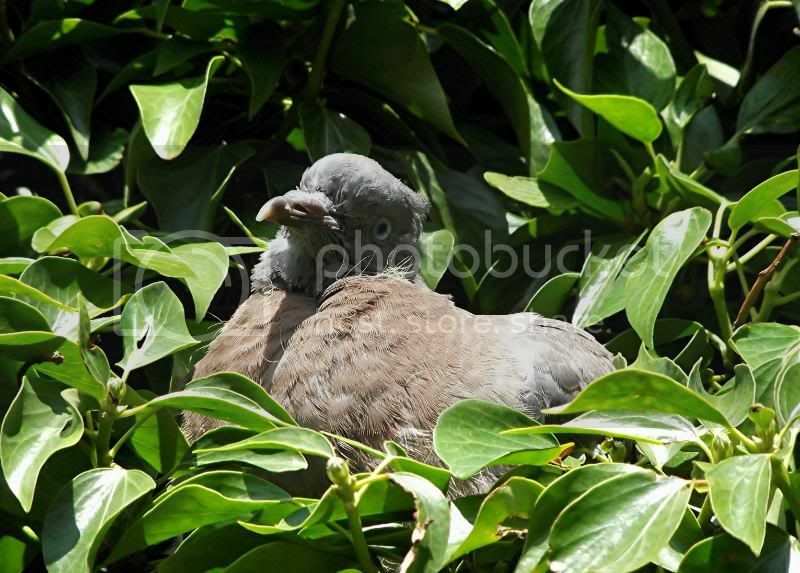 We have adult pigeons around the area that my neighbour has always fed so one day when two landed on our lawn, Woodie was chirruping and moving his wings like baby birds do, but they ignored him and flew up into the ivy on our wall and Woodie followed them, but they soon disppeared so he remained in the ivy on his own for a couple of hours. He then disappeared over the wall so I thought he'd left home but he was soon back on the lawn and back in his cage for safety! Three days later, around 7pm at night, he was on the lawn and an adult pigeon appeared and the pair of them took off onto our roof, then over the back garden onto the roof over our back wall and I thought he'd gone for good but the next morning he was sitting beside our front fence, so he was back in the cage with his warm peas! He's had another attempt, gone over the wall and returned so we've had him since 24th June and he is definitely looking loads better that when we found him, looking a bit injured as can be seen in the picture with his wings spread out on the lawn, so I really hope he will survive and have a happy life and find some feathered friends, otherwise I think we've got ourselves a pet pigeon. Maybe if he leaves home, he'll come back every day for something to eat! I have been taking hundreds of pictures and video clips of him and here's a few pics from when I first saw him, injured! 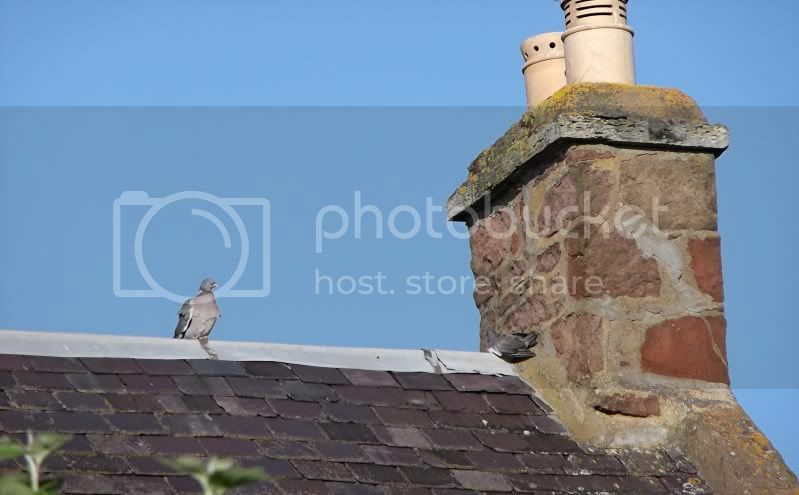 You can see when he was on the farmhouse roof, where he looked far too small to be out on the roof, so I was glad when he came back. 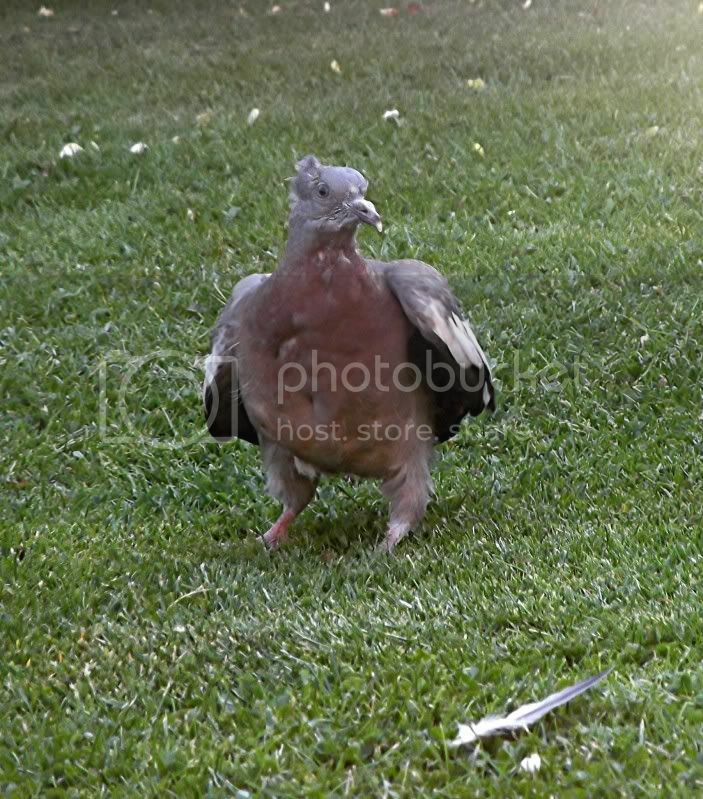 Also he doesn't seem to have much of a tail and he struggles and flaps his wings much harder to gain height, unlike adult pigeons who have long tails that fan out when in flight! I'm open to advice! You can see he was injured (pic 1) when I first found him, probably next door's cat... hence he's been in the cage for protection and in our gazebo in case it rains at night! About 10 days after we had him... looking scared as this was the first time he was about to leave! His first attempt at leaving home! Looking happy and content in our ivy on the front wall, about 15 days after we'd started looking after him. HE'S SUCH A CUTE WEE THING!!! I know I have to let him go for good but I shall miss him hugely as he's so cute and sits on my hand, but hopefully once released, he will come back to feed with other pigeons that are around and come into the garden most days. I thought I would let him go today but it's raining and i'd hate him to get cold and wet, so I may delay it a bit until it's drier!